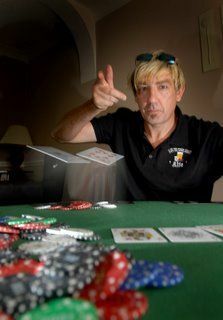 In non-crazy-governor-attempts-to-take-over-online-gaming news, a poker player in the U.K. set an official world record, according to the World Records Academy. Dave Cain set the record by playing poker for 72 hours and 12 minutes in September of 2008. He played heads-up deep stack poker at the Library Bar in Lincolnshire, England, and beat the previous record of 72 hours and 2 minutes held by Larry Olmsted. To make the record official, Cain had 1 steward, 1 practicing medical practitioner, and 2 official witnesses in attendance. And funds were raised during the event for two local hospices. Cain is the manager of the Live Pub Poker League in the U.K. When did the World Records Academy take over for the Guinness Book of World Records? Looking further, the WRA looks to be Guinness’ competitor for whatever reason. Having two kinda diminishes the idea of a single world record, huh? In my autographed biography of Johnny Moss, he says he played Paul Harvey five days. In my early days, I was geared to go to sleep about 6 a.m. The pros had a big advantage because they were used to staying up all night. In a marathon match, Bill Smith played Jim White heads up a couple of days. Ed the loan shark was there. When the tide would turn and one would get broke, Ed would make a loan and the game would go on. They kept paying juice and getting re-financed and finally Ed broke them both. Sleep is more important than poker. There have been longer sessions, but not under the watchful eye of Guinness. 72 hours is barely three days. I’ve played online poker for 48 hours straight, so it stands to reason there are about a thousand people out there who could pull a 4-day session. 5 days is about what human endurance can stand; check out the record for most movies watched in a single sitting. cocaine is one hell of a drug..